In previous posts we have noted that the plagues of Egypt in Exodus were judgments against the gods of Egypt (Exodus 6:6; 12:12). See here and here. In the plagues God was showing that the false gods were impotent and that Yahweh alone was the true and living God. In some of the plagues it is possible that more than one Egyptian god may have been targeted. Some scholars believe that Imhotep, the god of medicine, was shown to be powerless with such plagues as the boils. Imhotep, god of medicine. Brooklyn Museum. Photo by Leon Mauldin. 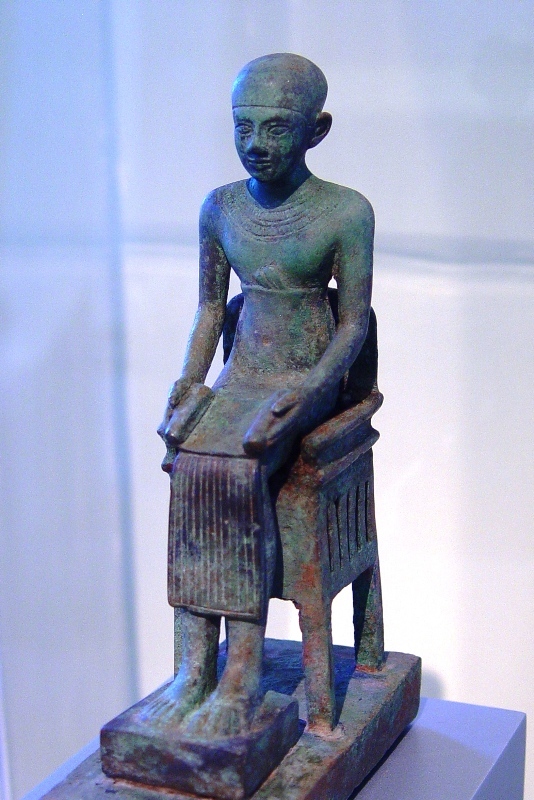 Imhotep, the polymath and architect of genius employed by Djoser, was deified soon after his death. Imhotep and Amenophis-sa-Hapu, who was Amenophis III’s architect, became a popular pair of gods for the everyday cares of the man in the street, especially in the field of medicine. In common with Thoth, Imhotep became the special tutelary god of scribes and learned men. The Greeks equated him with Asclepius (Egypt, Phaidon, 403-404). Tomorrow morning I am to begin a 6-Day meeting at Kimberly, north of Birmingham, AL. This entry was posted on Saturday, June 4th, 2011 at 10:54 PM and is filed under Bible History and Geography, Bible Study, Egypt, Old Testament. You can follow any responses to this entry through the RSS 2.0 feed. You can leave a response, or trackback from your own site.